As a community, we have a deep emotional connection with our Cemeteries. More than that, we know there is a need to care for them continuously, if the memories of our loved ones are to be perpetuated with the love and respect they deserve. 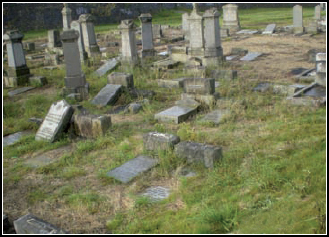 All who have visited Glenduffhill and Riddrie Cemeteries in recent years agree that they need urgent, extensive repair, and accordingly, we are now about to begin a major refurbishment project. Below, we set out our plans, and ask for your help, without which they cannot succeed. 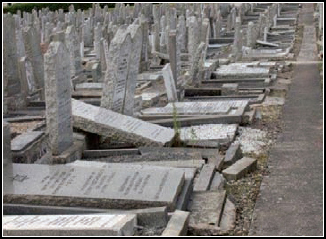 Glenduffhill was opened in 1933, and is now the main active Cemetery for the Orthodox Glasgow Jewish Community with almost 8000 graves. Many paths and graves are now in a very poor condition. (e.g. photos 1 & 2). There simply have not been the funds available to maintain them properly. We plan to repair paths and kerbstones of lairs, and to reposition tilting, unstable or fallen headstones to a near horizontal position. Over the past two years, the GHBS has created some new paths, and upgraded the Tahara area and Prayer Hall at a cost of £90,000, (e.g. photo 5), but there is a pressing need for work on a much larger scale. Riddrie Cemetery opened in 1905 under the auspices of South Portland Street Synagogue and was taken over by GHBS in the early 1970s, when the Synagogue closed and the Cemetery neared full capacity. As a result of disuse, this Cemetery has suffered badly from lack of maintenance and vandalism. (e.g. 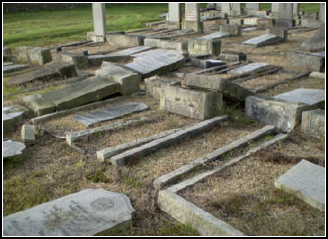 photos 3 & 4) We want to reposition unstable or fallen headstones to a near horizontal position and repair kerbs. The grounds at Riddrie are under the control of Land and Environmental Services at Glasgow City Council, who are strong supporters of this project, and they have indicated their willingness to improve and sustain the overall landscaping condition of the area. Once these Cemeteries have been brought back to an acceptable standard, they will be maintained by the staff of the GHBS. This is therefore a one-off project. 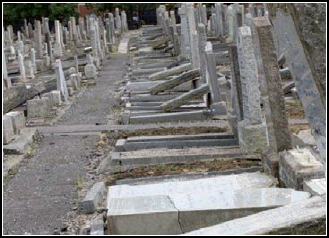 Andrew Syme Associates, the Consulting Surveyors who developed the plans and coordinated the recent successful projects at the Jewish Cemeteries at Sandymount and Glasgow Necropolis, have prepared a specification of proposed works, and provided an estimate of the costs involved. Whilst the total for all work identified is in excess of £1million (about 90% at Glenduffhill and 10% at Riddrie), much of the work could be performed if we raise a large 6 figure sum. We will prioritise the work to be done based upon the success of this appeal, and upon whether individual donors specify which aspect of the work they wish to support. 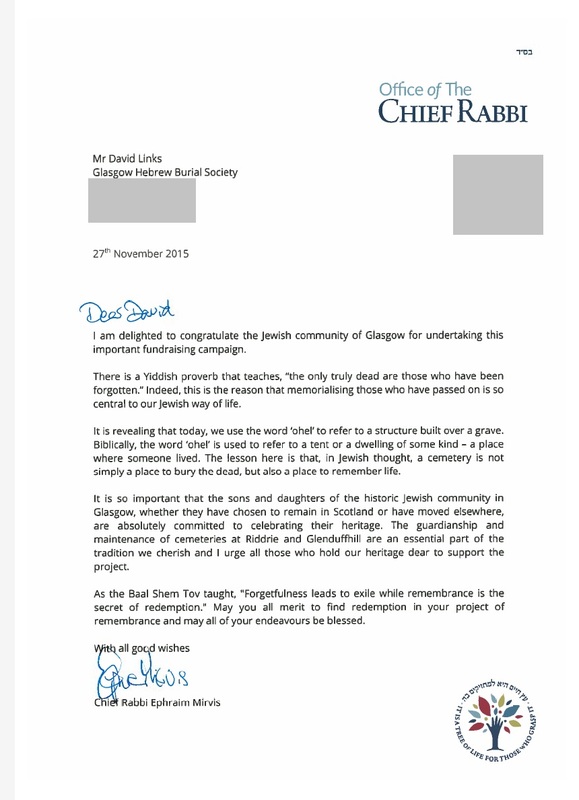 The vast majority of the Glasgow Jewish community have a link to at least one of these Cemeteries through the grave of someone in their families. With the cooperation and assistance of the Queen’s Park Charitable Trust which runs the Cathcart Cemetery, we are therefore launching a community-wide appeal, which we hope will be met with widespread and generous support. This can be accessed openly from anywhere in the world. 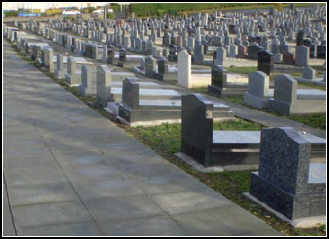 An excellent search facility on the website also allows sight of tombstones of family members, and related information. We hope and believe that appropriate charitable trusts will understand the importance of this project and wish to help us. Similarly, we hope to attract the support of various funding organisations in Glasgow, Scotland and further afield, who will be sympathetic to our aims. A Steering Committee has been established, including representatives from the GHBS and Cathcart Hebrew Burial Society, together with Stanley Coorsh who led the Sandymount Project. This group will direct the work of identifying potential sources of funding, and a further group who will act as a fundraising committee. Funds raised will be managed and independently audited in a separate account as part of the Charitable Account of the GHBS. This project can only succeed if it is backed by our community, collectively and individually, both within Glasgow and further afield. You can help us principally by making as generous a contribution as you can, and enlisting the support of those of your extended family who, although they may no longer live in Glasgow, you believe would want to support us. We hope that you will recognise that given the scale of the work to be done, this is no ordinary appeal, and therefore we hope many of you will donate substantially more than you normally would to appeal letters. Those donating over £5000 will be recognised, if they wish, on a new donors board to be installed at Glenduffhill. All donors will be acknowledged if they wish in an Honours Book - Platinum donors donating more than £5000, Gold donors more than £1000, Silver donors more than £250, and Bronze donors less than £250. The facility will be available for individuals or organisations to donate over several years. You can also specify whether you wish your donation to be used for work at Riddrie, at Glenduffhill, or at both Cemeteries. Beyond that, if you know of other potential sources of funding, we would be delighted and grateful to hear of them. We will do our best to keep the community, and all donors, fully informed of progress. Please enclose your name and address, and state whether you wish to Gift Aid your donation, to enable us to reclaim income tax you have paid on it. Photo 5 - Recent work at Glenduffhill Cemetery.